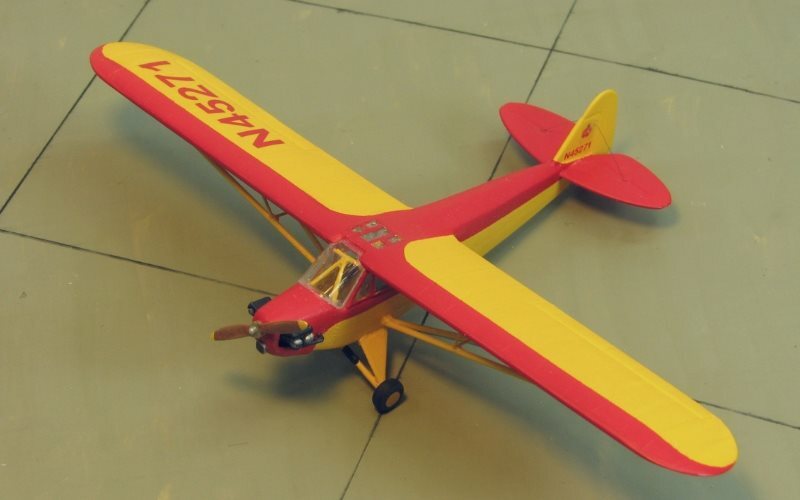 One of the first model airplanes I ever built, in the early 1950s, was a Comet Models Struct-O-Speed balsa wood sticks and tissue paper Piper Cub. That model succumbed to a child's play almost 70 years ago, but I've always loved the Cub. Starting with the 1/72 scale Kopro kit of the military Piper L-4H Cub, kit No. 31, I converted it to the civilian J-3 Cub by sanding off all the window frames from the clear parts, sanding and polishing them clear again and re-masking to represent the civilian version's glazing, including the differently configured top and half-elliptical side glazing. The wing support struts and braces broke when removing them from the sprues, so I replaced them with styrene rod struts and bent copper wire braces. The tail surfaces' wire bracing is made from 0.004" smoke colored "invisible" nylon quilting thread. After priming with Testors Model Master enamel flat white, I airbrushed Testors Model Master Acryl chrome ("Cub") yellow and guards red, thinned 4:1 with lacquer thinner, for the finish colors. I created the 1950s era civilian registration number decals with word processing software and printed them on Testors clear decal paper. I downloaded the Piper Cub logo from images on the internet and printed that on the decal paper as well, applying it over a masked patch of the white primer coat on the vertical stabilizer.